My 2018 Running Goals + Spring Marathon Reveal! Happy Wednesday! As the year is winding down, I thought this would be a good time to discuss my 2018 goals. Overall 2017 was a decent year of running. I had back-to-back training cycles – Brooklyn Half Marathon and Chicago Marathon – which equaled 32 total weeks of training this year (yikes)! Because of this, I definitely hit runner burnout, but I’m happy to say that it didn’t last too long. While things didn’t go exactly as planned this year, I’m still thankful that I was able to run a few races, meet new people and get through the year primarily injury free. I’m excited to see what 2018 will bring! …but first, let’s review the 2017 goals! Unfortunately this didn’t happen – I didn’t run a race in any new states this year. However, I did do a training run in Minnesota when I was there for a conference and I did run in a new country (Rock ‘n’ Roll Montreal), so maybe that counts for something? My eating habits always go up and down. I’ll be really good for a few weeks and then not so good for a few weeks, lol. I did focus a lot on adding some sort of vegetable to every meal, but I still ate meat a little more than I would have liked. This will continue to be a work in progress for me, but I’m going to implement “vegetarian weeks” next year, and I’ll have an accountability partner doing this with me, so I hope that will help! Although I didn’t get the result I wanted, I did complete my second marathon in October – a finish is a finish! I had high hopes that this would happen for my marathon, but it wasn’t meant to be. I’ll be rolling over this goal to 2018. I definitely embraced yoga more during my training cycles but I’ve really been lagging with it lately. I have just accepted the fact that I don’t love yoga and that’s okay – I have to stop forcing it. That’s not to say that I won’t do it again, but I don’t want to commit to doing it X number of times per week. …and now onto my 2018 goals! I have not set a PR in years. I can blame it on injuries, not training as hard as I should, or a few extra pounds, but really there is no excuse. While I would be happy with a PR in any distance, I would really love a PR in the marathon. I’m hoping (fingers crossed) to get that PR at The Yuengling Shamrock Marathon on March 18th. Yup, I’ve picked my Spring marathon (although technically Spring doesn’t start until March 20th, but close enough)! Although the weather has been a little cray-cray for this race the past few years, I have faith that it won’t be as hot as Chicago. I’ll also have a shorter training cycle (12 weeks) so I hope that will help me avoid runner burnout. Oh, and since a few people have asked, I narrowed this race down from 3 choices – Shamrock Marathon, Rock ‘n’ Roll New Orleans and the Cleveland Marathon. Flights to New Orleans were VERY expensive and I heard that the second half of the marathon was boring, so I ruled it out. For Cleveland, I’m signed up for the half marathon and want to keep it that way since I really want to enjoy my time there and run with no pressure. Since I didn’t hit my goal of adding 2 states last year, let’s aim for adding 4 states this year – makes sense right?! If all goes well, I will be running races in Connecticut, New York, Virginia, Ohio, Delaware and South Carolina in 2018 – 4 of those would be new states. I love that I can use running as a way to explore new cities and hope to do that more next year! I want to see more red on this map! I’ve made it pretty clear that I’m a fan of incorporating other workouts besides running. Yes, running is definitely necessary, especially during training, but I need variety in my workouts. Whether it’s kickboxing, spinning, boot camp or body works, I like to take different strength/cross training classes. I do this to make sure I’m working all my body parts, not just my legs! This will also help me to keep a great balance even when I’m not training for a race next year. I didn’t volunteer for a race this year or last year and I really missed it. I would love to do this again in 2018. We run so many races, so it’s only fair that we volunteer at them as well! We all know that the volunteers are often the backbone of a race, especially large races. I have vivid memories of volunteers that have helped me through a tough spot in race with their words on encouragement and I would like to be that person for someone else. I’m not sure which race I will volunteer for, but at least I have months to decide! I’m sneaking in one last goal and it’s totally unrelated to running! I’ll be 35 in April. I’m currently single (with no prospects) so it’s definitely time for me to start thinking about freezing my eggs while I still have some. I definitely want to have kids but I just need to find the right person. By freezing my eggs, this will take a little pressure off of me to find “the one”. Do you set yearly goals? If so, what are your goals for 2018? I’ve heard great things about VA Beach as well! I’m glad you found a race you’re excited about. Thanks Megan. I hope to have a positive experience at the marathon! I know that marathon PR is in you. May 2018 be the year all the awesome comes out! A March marathon sounds wise and least likely to be hot, which is key. I agree with you that the super-long training cycle takes a physical and mental toll. All the very best in crushing your 2018 goals! Thanks Marcia! I’m hoping that training in cooler temps might actually help me – fingers crossed! I’m just hoping to get semi-decent weather lol! Thanks for the recommendation about the Denver races! Thanks so much Deborah – I have high hopes for Shamrock! I’ve heard such great things about Yuengling! And I do like their beer, just saying…. Looking forward to seeing you crush your goals in 2018. You know that the cross training has made a huge difference for me. I hope it is the magic bullet for you! LoL if they have good beer, that means they have to put on a good race, right?! Thanks so much for all of your support this year! Kim I love and support all of this!! Let me know how I can support. Now you have me thinking maybe I want to try the marathon too! You’ve pushed me farther than I ever imagined. I’m excited to see what this year will bring for us. You are too sweet Shirley – thank you! I know you’ll do another half marathon next year, and maybe a marathon too! Love your goals for next year and I’m so glad I stumbled across your blog this year. I look forward to following along with you in 2018! Thanks Jessica! I feel the same way – I love that the weekly wrap lead me to your blog this year as well! Yayyyy, I’m running the Shamrock half, so now I can repay the cheering favor. Cant Wait!!!! You know, I train hard for PRs, but I also know no matter how well/hard you train, it’s never a given. For me (oddly enough) it’s not the measure of how well I did. It’s more how I feel — did I feel strong? Did I stay strong mentally? Do I feel good after the race? That said, it took me a lot of years to get my PRs this year — it definitely didn’t happen overnight. I hope that 2018 is your year! You work really hard & you deserve it. I really love your outlook on PRs and races. I think “did I feel strong” is a much better way to look at a race! I’m going to use that mindset as I train for Shamrock – thank you! Great goals! Looking forward to reading your progress! How did you like Montreal? I grew up there. It’s so much fun to hear about people’s goals for 2018 – I’m a huge goal person myself. Good luck in 2018! I didn’t care too much for the course in Montreal plus it was SUPER hot and humid! But the food was really good there! Love all your goals! I’d love to run a race in every Province in Canada – have only managed two so far but working on a race-cation I think to get another Province off my list! That’s awesome! I hope you’re able to check off another province on your list next year. I’m loving your goals for 2018! I know you have that marathon PR in you and I think an early March race is a smart choice. Now I need to get you up to MA and add some more red to your map 😉 Wishing you all of the best for 2018! Yes I do need to make my way up to MA, maybe Boston for a race?! I just set my 2018 goals today! Nothing too crazy, but hoping to climb more mountains and lift more heavy things in 2018. Happy New Year! Thanks Kim! I hope that we get to meet up at Cleveland or another RnR race this year! Looks like a great plan for 2018! Shamrock should be a great race and I have no doubts that you can PR! Running is such a great way to explore different places. Looking forward to seeing you achieve your goals in 2018! Shamrock! I’m so excited for you – I believe that you will PR in 2018. You’ve definitely got it in you! I also love running in different states. I don’t have a specific goal for that but it’s just one of my favorite things about traveling. I also need to find a race to volunteer! Thanks Janelle! I’ll have a shorter training plan this time so I hope all goes well, lol! I honestly can’t wait until May – I’m so excited!! Ohh! I’ve heard great things about that marathon. I think you’ll really enjoy it. I’m debating on the Cleveland half. If I sign up for it, we should totes find a way to meet up! I also love the 25 states goal……I’ve been thinking 50 but I feel that is honestly very unrealistic. I’m almost half way to 25 and feel like I could manage that! Yay for PR’s in 2018. I believe that you will get one!! Thanks so much Sara! 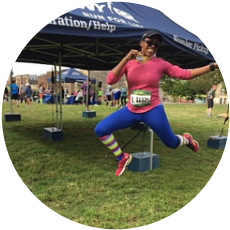 I hope you sign up for the Cleveland Half – I would love to meet you in person! Good luck on all your 2018 goals! I am sure you will PR next year too!!!! Good luck in your 25 state quest! Excited to hear about this! I’ve heard many great things about this race. That’s awesome! I haven’t heard anyone say a bad thing about this race so I’m really looking forward to it.